The panel included, from left to right, Athletic Director Damon Evans, Student-Athlete Advisory Committee President Abigail Bentz and Student Government Association President Jonathan Allen. Haemee Lee/Mitzpeh. Students engaged in a respectful conversation at a town hall meeting Thursday night to voice their concerns with this university’s athletics department and administration, following the death of Maryland football player Jordan McNair in June. 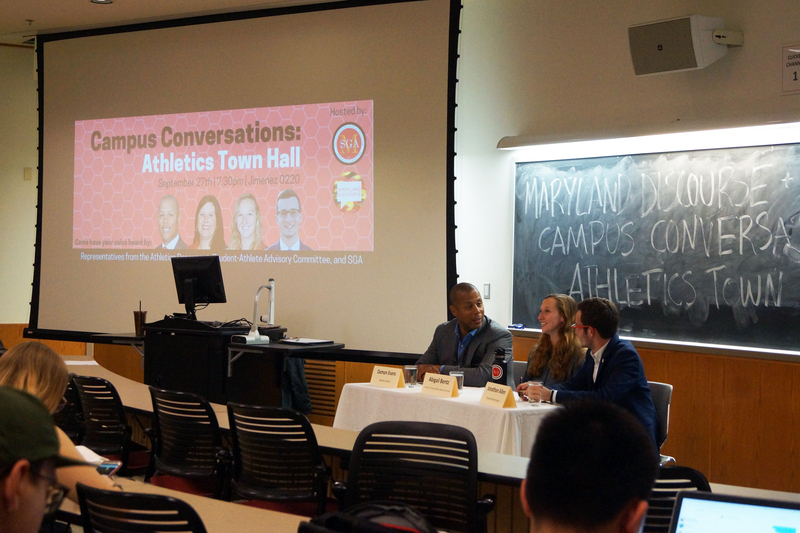 Evans, Student-Athlete Advisory Committee President Abigail Bentz and Student Government Association President Jonathan Allen were invited as panelists by Maryland Discourse and SGA to address issues like transparency and future plans. McNair’s death was the result of a heat stroke suffered during a team workout in late May, according to the Jordan McNair Foundation. An ESPN report on this university’s “toxic” football culture led to the creation of an external task force to investigate the culture under head coach DJ Durkin, who was placed on administrative leave, and left many students with questions. When asked about Durkin’s firing or reinstatement, Evans said, “Based upon what the findings [of the reports] are, we’re going to do what’s appropriate.” He added that it is fair to have due process, meaning the department will look at the facts that the independent commissions present before making a decision. Allen expressed his concerns of a broader issue not just at this university but all across the country in collegiate athletic programs. “If somehow coach Durkin is reinstated, I think that’ll be indicative of…instances where athletic departments have valued their bottom line more than they have their student athletes,” he said. The voices of student athletes and others working under these coaches are the only ones that matter, Allen said. He noted that it may be difficult for student athletes to speak up knowing that their education and futures are on the line. Moving forward, SAAC created a feedback link for student athletes to anonymously submit their thoughts about what they and their teams may be going through. “Not everyone is super aware of it, so it is important that we note that it is in existence, and we have that available to all the athletes now,” Bentz said. A common theme throughout the conversation was the need for open communication, and SGA is working to improve that, Allen said. He added that this town hall meeting is part of a series of campus conversations that will bring student voices in on various issues. On social media platforms, Allen said that SGA will continue to do “Ask Me Anythings” and is bringing back WTF UMD, which stands for “what to fix” UMD. Students may or may not know that $406 from their mandatory fees, which is the largest portion of fees, goes to athletics. Grant Gioffre, a senior government and politics major, said, “[The budget and finances] are very important, but I think recent events with Jordan McNair really trump all of those.” He added that there should be a meeting like this again after the report comes out. No Replies to "Students bring questions, concerns around Jordan McNair’s death to SGA town hall meeting"